Lance Armstrong's reputation lies in tatters after the United States Anti-Doping Agency labelled him a "serial" cheat who led "the most sophisticated, professionalised and successful doping programme that sport has ever seen". 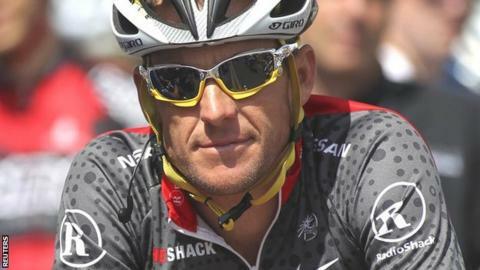 Usada has already banned the 41-year-old American for life and stripped him of his seven Tour de France titles. But now it has detailed why it took such action, using evidence from 11 of Armstrong's former team-mates. Armstrong has always denied doping. But the Texan has not contested Usada's charges. His lawyer has described Usada's report as a "one-sided hatchet job". Sean Breen called it a "taxpayer-funded tabloid piece rehashing old, disproved, unreliable allegations based largely on axe-grinders, serial perjurers, coerced testimony, sweetheart deals and threat-induced stories". The only apparent reaction from Armstrong himself came in the form of a tweet which read: "What am I doing tonight? Hanging with my family, unaffected, and thinking about this," with a link to his Livestrong website. In an statement accompanying its report, Usada chief executive Travis T Tygart said there was "conclusive and undeniable proof" that Armstrong was a cheat who was at the heart of a team-run doping conspiracy. The report has been sent to the International Cycling Union (UCI), the World Anti-Doping Agency and the World Triathlon Corporation. In it, Usada says it has "found proof beyond a reasonable doubt that Lance Armstrong engaged in serial cheating through the use, administration and trafficking of performance-enhancing drugs and methods that Armstrong participated in running in the US Postal Service Team as a doping conspiracy". It added that his goal of winning the Tour de France multiple times "led him to depend on EPO, testosterone and blood transfusions but also, more ruthlessly, to expect and to require that his team-mates would likewise use drugs to support his goals if not their own". It continued: "It was not enough that his team-mates give maximum effort on the bike, he also required that they adhere to the doping programme outlined for them or be replaced. "He was not just a part of the doping culture on his team, he enforced and re-enforced it. Armstrong's use of drugs was extensive and the doping programme on his team, designed in large part to benefit Armstrong, was massive and pervasive. British Cycling performance director Dave Brailsford described the report as "jaw dropping". "Usada chief executive Travis Tygart promised the evidence against Lance Armstrong and his five co-defendants would be thorough. He wasn't kidding. "As requested by the sport's governing body, the UCI, Usada has now sent them its 'reasoned decision' as to how it found the seven-time Tour de France champion guilty of running a systematic doping ring. It has also sent 1,000 pages of eye-witness testimony, lab results, scientific data, emails and financial records, evidence Tygart describes as overwhelming, conclusive and undeniable. "Cycling's equivalent of War & Peace will also be published on Usada's website later today... it will be gruesome bedtime reading for Lance Armstrong's dwindling band of believers." He said he was staggered by the extent of the systemic doping revealed and told BBC Radio 5 live: "It is shocking, it's jaw dropping and it is very unpleasant. It's not very palatable and anybody who says it is would be lying, wouldn't they?" The UCI now has 21 days to decide whether to appeal against or comply with Usada's decision to strip Armstrong, who now competes in triathlons, of his Tour de France titles and ban him for life. Armstrong, who overcame cancer to return to professional cycling, won the Tour from 1999 to 2005. He retired in 2005 but returned in 2009 before retiring for good two years later. Usada claims the evidence against Armstrong was "beyond strong" and stretched to more than 1,000 pages, including sworn testimony from 26 people, including 15 riders with knowledge of the US Postal Service Team and the doping activities of its members. Among the former team-mates of Armstrong's to testify were Tyler Hamilton and Floyd Landis. Landis was stripped of his 2006 Tour de France title for failing a dope test and was recently found guilty in a Swiss court of defaming the UCI for alleging they had protected Armstrong from doping claims. The other former team-mates who gave evidence were Frankie Andreu, Michael Barry, Tom Danielson, Levi Leipheimer, Stephen Swart, Christian Vande Velde, Jonathan Vaughters and David Zabriskie. Usada praised the "courage" shown by the 11 riders in coming forward and breaking the "code of silence". It said: "Lance Armstrong and his handlers engaged in a massive and long-running scheme to use drugs, cover their tracks, intimidate witnesses, tarnish reputations, lie to hearing panels and the press and do whatever was necessary to conceal the truth." Tygart added: "The riders who participated in the USPS Team doping conspiracy and truthfully assisted have been courageous in making the choice to stop perpetuating the sporting fraud, and they have suffered greatly. "I have personally talked with and heard these athletes' stories and firmly believe that, collectively, these athletes, if forgiven and embraced, have a chance to leave a legacy far greater for the good of the sport than anything they ever did on a bike. "Lance Armstrong was given the same opportunity to come forward and be part of the solution. He rejected it. "Instead, he exercised his legal right not to contest the evidence and knowingly accepted the imposition of a ban from recognised competition for life and disqualification of his competitive results from 1998 forward." In an interview with BBC Radio 5 liveUp All Night, Breen explained why Armstrong had chosen not to fight Usada's charges. He said: "Lance came to the conclusion that he has many, many other positive things he needs to accomplish in his life and defending himself for another decade and paying lawyers was not one of them that he wanted to do." Usada confirmed that two other members of the US Postal Service team - Dr Michele Ferrari and Dr Garcia del Moral - have also received lifetime bans for their part in the doping conspiracy. Three further members - team director Johan Bruyneel, a team doctor Dr Pedro Celaya and team trainer Jose Marti - have chosen to contest the charges and take their cases to arbitration. Tygart also called on the UCI to "act on its own recent suggestion for a meaningful Truth and Reconciliation programme". "Hopefully, the sport can unshackle itself from the past, and once and for all continue to move forward to a better future," he added.